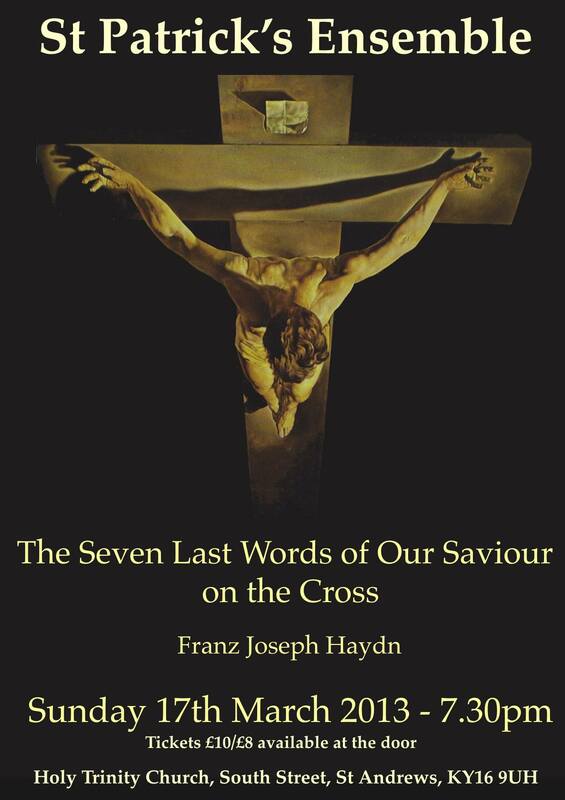 On Sunday 17th March at 7.30pm in Holy Trinity Church, St Andrews, St Patrick’s Ensemble will perform The Seven Last Words of Our Saviour on the Cross by Joseph Haydn. The work is a moving reflection on the ‘Seven Last Words’ and will be performed in Haydn’s own arrangement for string quartet. The movements will be interspersed with readings of the ‘Words’ and spoken reflections. The quartet will consist of Paul Livingston and Daniel Rainey, violins, Jessica Wyatt, viola, and Robert Anderson, cello – all outstanding young players who have studied in Scotland as well and internationally. Based in Glasgow, the St Patrick’s Ensemble has performed throughout Scotland, including performances of the Vivaldi Four Seasons at the Usher Hall, and an evening of chamber music by James MacMillan at Glasgow University, introduced by the composer. This promises to be a reflective and moving concert in a beautiful and atmospheric church, ideal for the Easter season. Tickets are priced at £10 (£8 concessions) and will be available at the door. Please encourage friends and relatives to attend! This entry was posted in Classical Music, Concerts, gigs, News and tagged Chamber music, concerts, Easter music, Joseph Haydn, Lent, Seven Last Words, St Andrews, St Patrick's Ensemble, String Quartet on March 10, 2013 by jesswyatt.